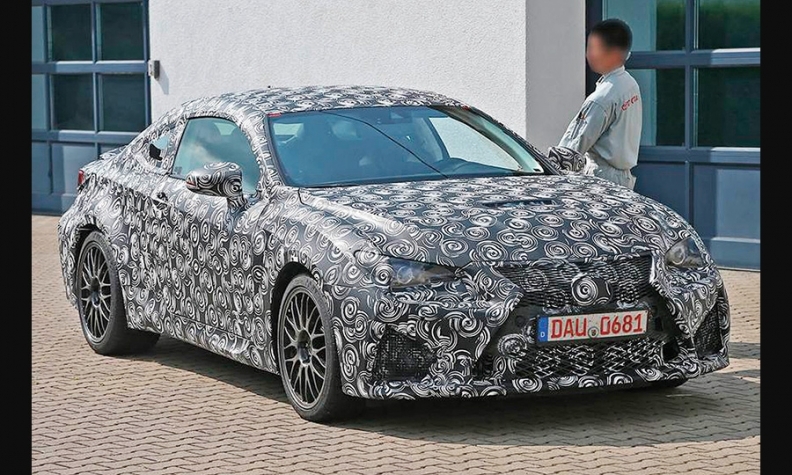 A spy photographer captured this camouflaged version of Lexus' RC 350 coupe. LOS ANGELES -- Lexus will add another coupe to its stable, supplementing its IS C retractable hardtop with a pure coupe called the RC 350 that will be unveiled at the Tokyo Motor Show in November. The RC 350 will arrive in U.S. dealerships in late 2014, said a company source speaking on condition of anonymity. It will be based on the LF-CC concept from the 2012 Paris auto show and will use Lexus' IS/GS platform. Prototypes of the new coupe were spotted recently during track testing in Germany. The RC 350 will be powered by a 3.5-liter, 306-hp V-6 engine, the same as the IS and GS sedans. A hybrid version will be offered in Japan and Europe, but not in the United States. An RC F performance version will be unveiled in January at the Detroit auto show. A Lexus source says the RC F will be powered by a 460-hp V-8, up from 416 hp for the current IS F sedan. There currently is no coupe version of the IS F in the lineup. By comparison, the BMW M3 has a 414-hp V-8, although insiders say the upcoming M4 coupe will have a 450-hp turbo-six engine. At the introduction of the redesigned 2014 IS sedan in March, Lexus engineers said the IS C hardtop convertible would continue on the previous-generation platform for the immediate future. In November, Lexus filed for a trademark for RC 350 and RC F with the U.S. Patent and Trademark Office.